Happy Monday to you all! Im so excited about todays post because I get to share with you my new blog make over!!! And I just love it!!!!! Veronica at VK Designs Company designed this awesome website! I just told her what I liked and she did the rest! I think this design is so me! 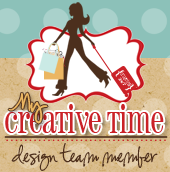 If you are interested in a new web design go check her out but be aware, there is a waiting list! So good luck! It was so worth the wait! Ok now back to todays post. As you know It's the "Scrapping the Little Things" at My Creative Time! And yes I have another video for you!!!!! So make sure you check it out! I love how this "smashy page turned out! I love how well Emma's products go so well with my style! Did you noticed the restroom peeps?? I heart them!!! This is a fun and simple entry into my Summer Smash book. Make sure you visist the rest of the design team for more inspiration! Big crafty hugs!!! This is such a cute, fresh layout! Love the colors and all of your embellishments! Loving the new look of your blog too, Nancy! you have the most AMAZING smash book!!! Super job on your pages...so fun to scrap everyday things...they happen too. Love the embellishments you have added. Your web page also looks so nice. How fun! She's such a cutie! And you are the BEST SmashBooker EVA!!!! ;) Love the video!! I love how quick and easy you make smashbook making look! I am envious of your talent. Nancy ~ Oh look how CUTE your daughter is!! How FABULOUS is your smash pages too! I just LOVE how everything flows ~ ALWAYS!!! I LOVE watching your videos oo! I must really have a class with you! Have a great weekend!